Split Second Timing - Hi-Beat Movement 36,000/hr. 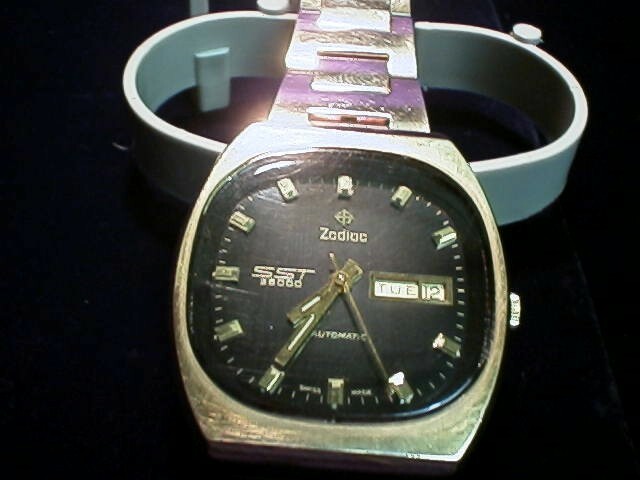 Funky 70's SST with an iridescent blue dial, day date at 3 and 9, signed crown, and the original band. This watch was serviced in 2000 and the crystal is scratch free. Sold for $125.00. This is a sharp watch. 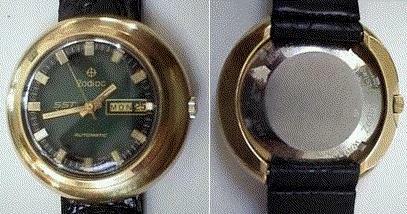 The great looking dial is original, and two colors. 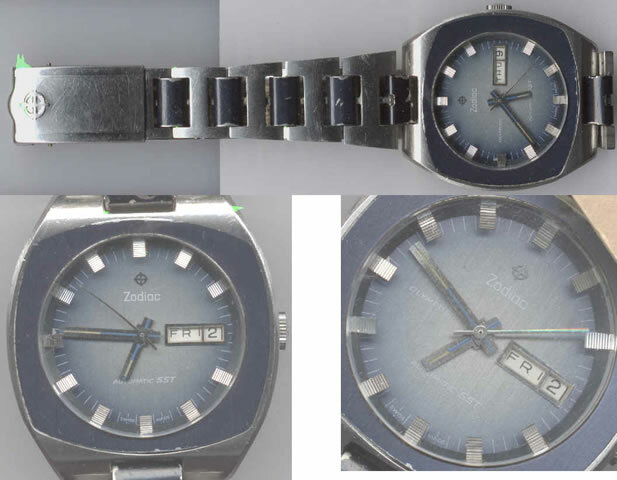 The bezel around the crystal is in two pieces, one looks like charcoal gray metallic, the other piece has a fluted design. Case is all stainless, with a screw back. 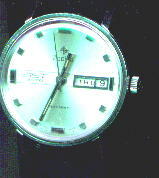 The movement is 17 jewel automatic, with day and date feature. The date changes by pushing the crown in. Comes on a new steel bracelet with a flip lock clasp. 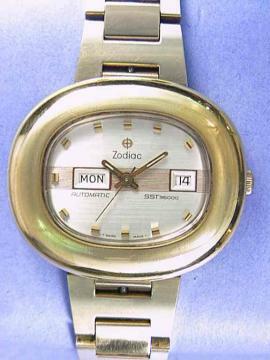 Overall, this watch is in excellent condition. 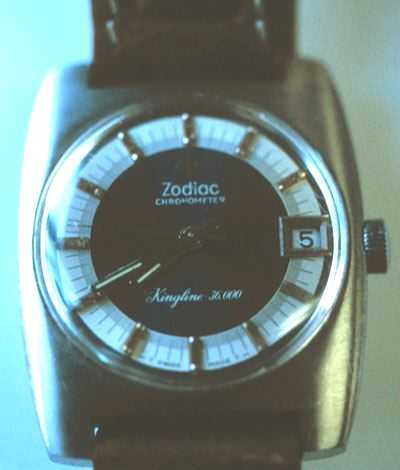 1970`s Rectangular ZODIAC AUTOMATIC 17 jewel Swiss movement. 18K gold plated case with stainless steel screw back. Water and shock resistant. 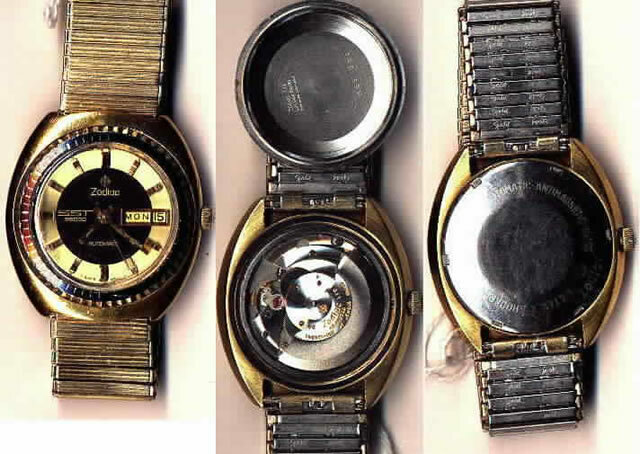 Dial is brown color with gold hack marks and gold hands. Day at 9 date at 3. Absolutely beautiful. Has new tan padded leather band. Comes with original box and hang tags. Went to $139.00 and did not sell. 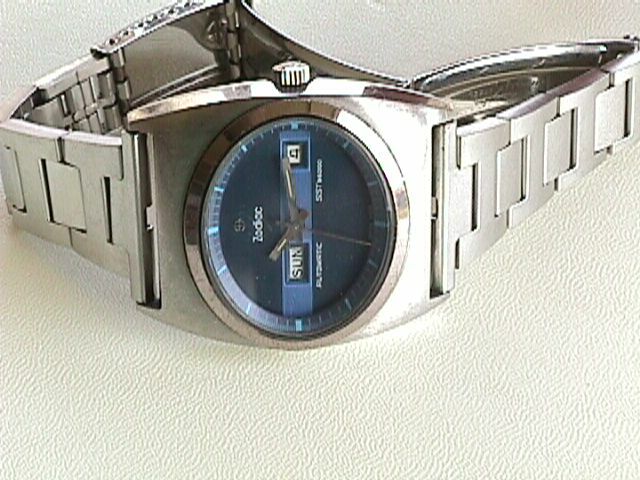 This is one unique watch..Heavy..all stainless steel case..swiss made..case and face in excellent condition..crystal had some scratches but I had them buffed out several years ago..has day and date boxes..works and runs perfect!! I've never seen one shaped like this..kinda egg shape..face is two tone DARK BLUE. Sold for $86.00. 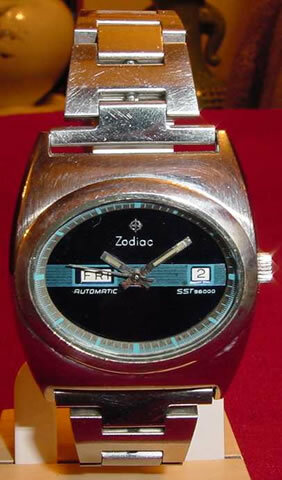 Description: Good: Zodiac Olympus Automatic SST with Day/Date. Blue enamel over S.S. 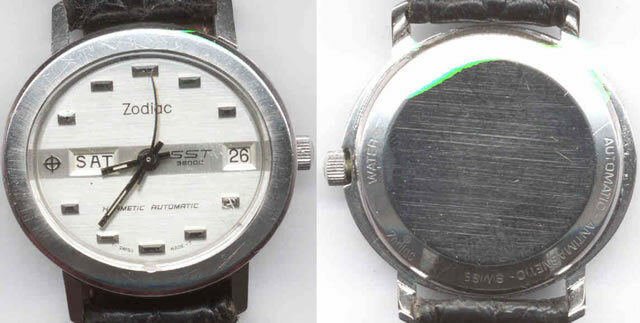 Original signed band same as watch, blue enamel center links surrounded by S.S. Looks like the band will polish up. 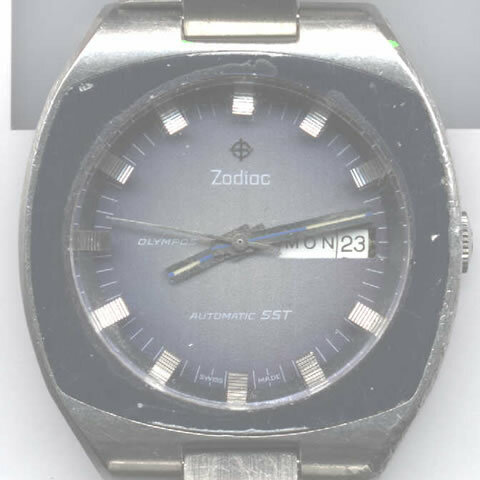 2628696 on back. All original timepiece with hi-beat movement. 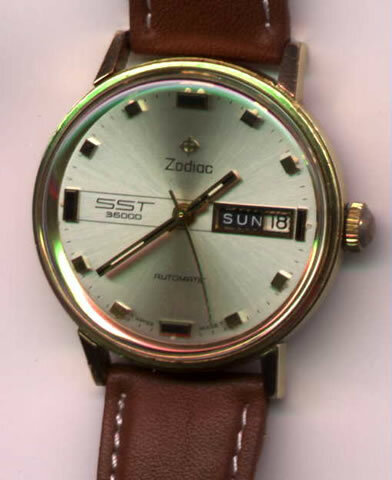 Raised SS hour markers that the hands pass under with a recessed dial. Bad: A 70's thing. Big. Heavy. FUGLY. 6 initials lightly hand scratched on back. Signed crown and stem pulls out in your hand when you try to set it. Rotor a little noisy. Runs after you shake it 3 times though! Recently sold for $95.00 as-is. 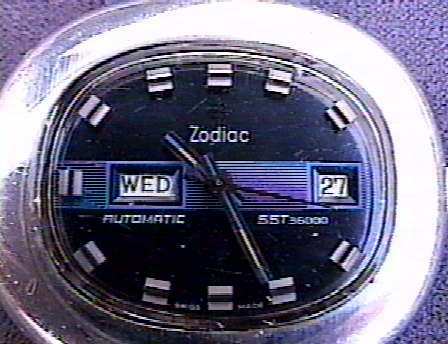 Zodiac SST day/date 36000 automatic movement wristwatch. 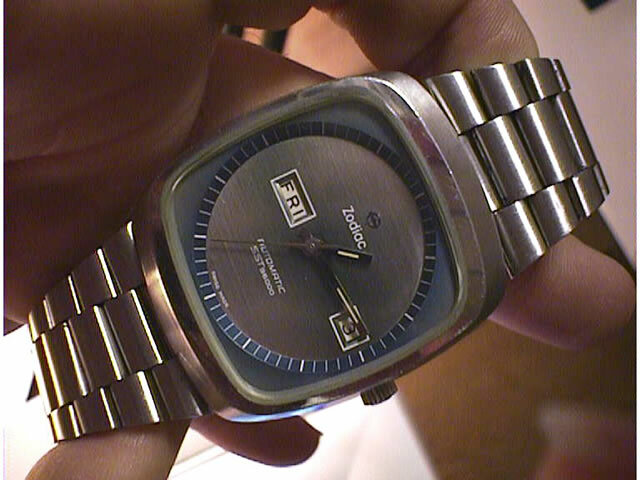 Great stainless steel round case, very clean dial & crystal. For Reference Only - No Gallery watches are for sale!! !